The obverse of the coin features the logo of the Bulgarian National Bank in the inner circle, with the year ‘1879’ written on the ribbon. 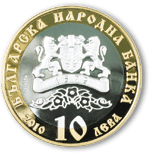 In circumference is the wording ‘БЪЛГАРСКА НАРОДНА БАНКА’, the nominal value of the coin ‘10 ЛЕВА’ and the year of issue ‘2008’. The reverse of the coin features in the inner circle two figures: of a Russian soldier and a Bulgarian volunteer from the Shipka Monument as a homage to the Russian and Bulgarian dead in the Russian – Turkish War for the Liberation of Bulgaria, with the year ‘1878’ written above them. In circumference is the text ‘130 ГОДИНИ ОТ ОСВОБОЖДЕНИЕТО’ (‘130th ANNIVERSARY OF BULGARIA’S LIBERATION’) and a wreath with the wording ‘ВЕЧНА СЛАВА НА ГЕРОИТЕ’ (ETERNAL GLORY TO THE HEROES) on the ribbon.